This section provides a breakdown of the weight, the cost, and the labor for the full conversion. The weight includes the van + conversion weight + payload. The summary might be helpful if you are planning your own conversion, but be careful to account for differences between what we did and what you plan to do. The quick summary is that the van starts at 4730 lb as delivered, the camper conversion adds 1030 lbs, and the payload (two people, water, propane, groceries, …) add another 970 lbs bringing the full up ready to travel weight to about 6700 lbs — well under the allowed weight of about 8600 lbs. Note (1): Includes just about everything including 50 lb PV panel that has not be mounted yet. We might add some small storage cabinets and other odds and ends later. I did weigh the van and get front and back axle weights and a total weight. There was a modest discrepancy between the actual scale weight of the converted van and the sum of the weights I estimated for each part (flooring, insulation, …), but only about 60 lbs. The maximum allowable weight for the ProMaster 1500 model is 4630 lb front, 5291 lb back, and a total of 8550 lbs — so, we have 900+ lbs margin on front axle, and 2200+lbs margin on back axle, and 1800+ lbs on total weight. So, it looks like the 1500 model on the 136 WB can easily handle a complete conversion. Curtains $109 2 6 EuroCamper on windshield, Reflectex rest. Flooring $204 20 96 Vinyl floor with polyiso insulation. Paneling $180 36 99 Hardboard wall and ceiling paneling. The detailed pages for each area (Insulation, Paneling, …) has a breakdown for the weight, cost and labor for that area. The labor column adds up to 185 hours, but I’m thinking this is on the low side. I did try to keep track of time spent as I went along for each job, but I’m guessing I missed some hours. One thing it does not count for sure is the many hours of internet research and trying to figure out what will work. I’m not very familiar with outfits that do that conversions. I have seen some of the work done by Morehead Design, and it looks good, and they will do it as simple or fancy as you like. Sportsmobile also does this kind of work and has a good reputation. Both of these places may be a long ways from you, so maybe look for a local guy also? A lot of people don’t like the orginal tires — especially for snow. We had to replace our back two tires due to a tire blowout on a gravel road on our Yukon trip. Did not have a lot of choice on the replacement as we were a couple hundred miles from nowhere. They found us a pair of Goodrich TK’s, and we have been happy with them. I’ll probably just get two more for the fronts very soon. Since the new ones are on the back, can’t tell a lot about snow performance, but the reviews say they are good and the tread looks good. 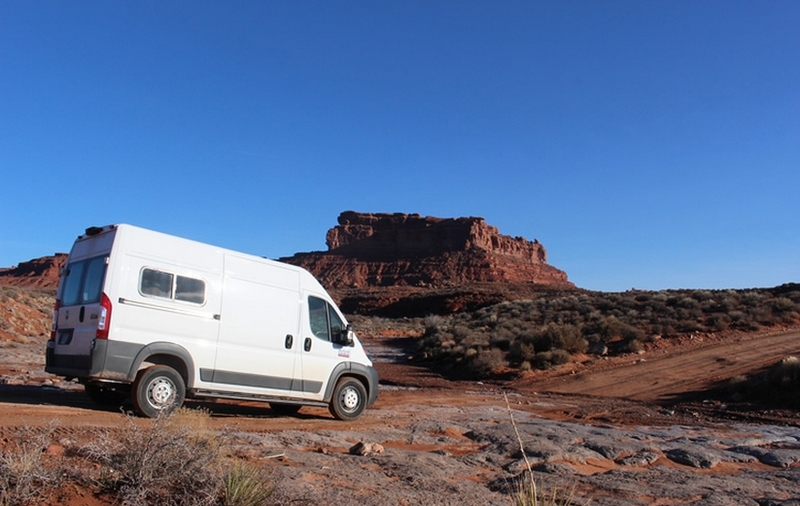 Lots of tire replacement discussions on the ProMaster forum with a range of opinions. If you replace your tires, please let us know what you get and how they work out. Great write up. Looking at doing something like your but unsure about the size. Are you happy with the size? I think the 136WB will work for us but I keep thinking that if I am going to do all of this work to make the van then I should maybe just get the 159WB to be sure. We also want to haul a few bikes and an inflatable boat with a 2hp engine (~30 lbs). Thoughts? Thx again for sharing your info. The 136 works out well for us, but we don’t haul equipment. I think that for you the 159 might be a better choice. It’s still pretty maneuverable. Lots of size discussions on the PM forum with many opinions. Impressive job. Your write ups are exemplary – lots of good detail with facts, not IMHO. I would only want to add a small shower and toilet with black water, but the Promaster may not quite have the volume. Any thoughts? I’d say its hard to work a permanent shower into the 136 wheel base PM, but definitely feasible for the 159 inch WB. Not much on the black water tank approach. I’ve never really looked at trying to work a black water tank under the PM and to what limits it would place on where you could put the toilet. There are some toilet versions that use an above floor black water tank that would be easier to work in, but not sure if they offer enough capacity to work well. Having had a couple RVs with black water tanks, I have to say I’m not a fan — maybe worth taking a look at some of the other options? I’d like to know what you are able to work out for the PM. Are you building and selling any of these Green RV Vans, or do you know of anyone who is making and selling them? Would you need a bigger power system to put in an RV roof air conditioner? Could I go there as an apprentice to help you, and learn to build my own Van? It was a lot of fun, but I don’t plan to do it for a living. Doing a roof AC without shore power will take a larger electrical system — some people have concluded its not really feasible to do a typical RV roof AC on a battery system. You would want to insulate very well, and then look for an AC that is just large enough to do the job and is efficient. One solution would be to only camp in places that have shore power available during the hottest weather when you need the AC. In weather that is just warm, opening windows and something like a Maxxfan can do a pretty good job of keeping you cool. In dry climates, evaporative coolers provide a lot of cooling for the power they use — much more efficient than regular AC — but only for dry climates. Sounds good — you did a really nice job on minimizing weight. That seems odd on the inverter in that you would think it would have some protection for overloads. Maybe you can let us know how that gets resolved. If you want to send me some pictures and/or suggestions for improvements on the conversion design that would be great — I’d start a new page for them. Hi Gary, I have the same Van and have mostly cloned your design although I went with a rear “garage” design. My total post-conversion weight came out at roughly 6200 pounds, 3250 front/2950 rear fully loaded for a week long ski trip, probably 200 pounds of gear. Everything is working except for the inverter which I think got fried by the expresso maker, I’m working with Tripp-Lite on it now. Great support. Thanks again for the inspiration!